This week, by a unanimous vote of 7-0, the General Assembly in Sitka, Alaska approved comprehensive non-discrimination protections for LGBTQ people within its city and borough. The city joins Anchorage and Juneau as the only cities to offer such protections in the state. 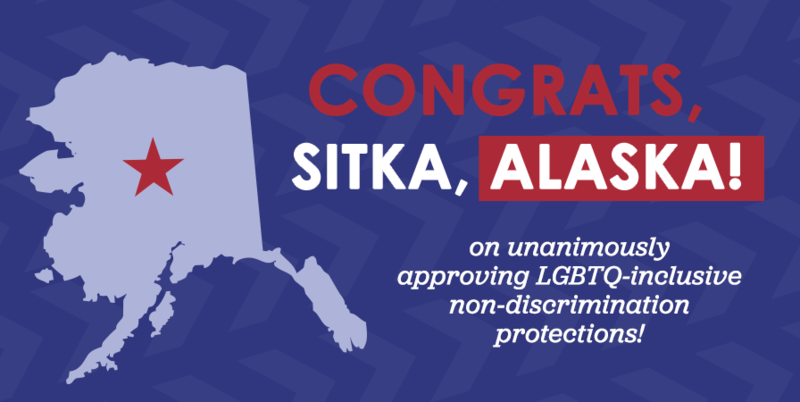 Freedom For All Americans congratulates Sitka on their passage of these important protections, and thanks Alaskans Together For Equality for their leadership in this important victory. The passage of this ordinance comes at a crucial time for Alaska, particularly the citizens of Anchorage. On April 3, voters in that city will go to the ballot to defend Anchorage’s current non-discrimination protections by voting No on Prop 1. Learn more about the campaign, Fair Anchorage, here.